President Reagan holding a "The Gipper" jersey at a campaign rally in Endicott, New York, 1984. The 1984 United States presidential election in New York took place on November 6, 1984, as part of the 1984 United States presidential election. All fifty States and the District of Columbia participated in this election. Voters in New York chose thirty-six representatives, or electors to the Electoral College, who selected president and vice president. New York was won by Ronald Reagan with 53.84 percent of the popular vote over Walter Mondale with 45.83 percent, a victory margin of 8.01 percent. In the 1984 election, New York turned out more Democratic than the nation at-large by about ten percentage points. The county results indicate a typical (for the time) split between the less-populated counties upstate, and the urban centers of New York City, Buffalo and Albany. 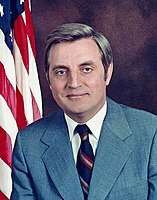 While Mondale carried the heavily populated boroughs of New York City overall with 61 percent of the vote, the strong Republican performance in most upstate counties as well as in the populated suburban areas around NYC was able to pull the state's electoral votes in favor of Reagan. A portent of the future was seen in Mondale carrying Tompkins County, home of the college town of Ithaca. He was only the third Democrat to do so since the Civil War, after Woodrow Wilson in 1912 and Lyndon Johnson in 1964, and Mondale managing this in a near 50-state landslide loss illustrates how much this county was trending. It is also noteworthy that this was the last time that New York voted more Republican than neighboring Pennsylvania. As of the 2016 presidential election[update], it is the last time New York has voted for a Republican in a presidential election, as well as the last time Schenectady County did so. 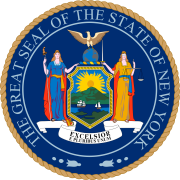 ^ a b "1984 Presidential General Election Results – New York". U.S. Election Atlas. Retrieved 6 February 2013.